In that way that artists do, going around town to check out the galleries, imagining where your work would look good, you might ask yourself, of all the exhibition spaces in NY, what’s the toughest, most demanding space? And then, beyond that, what’s the toughest wall? The answer would have to be: the long wall at Paula Cooper’s gallery. So exposed. Certainly, if you happen to be a painter, you would have to ask yourself, what would it take to hold that wall? Okay, could you do it with one painting? Impossible. Can’t be done. 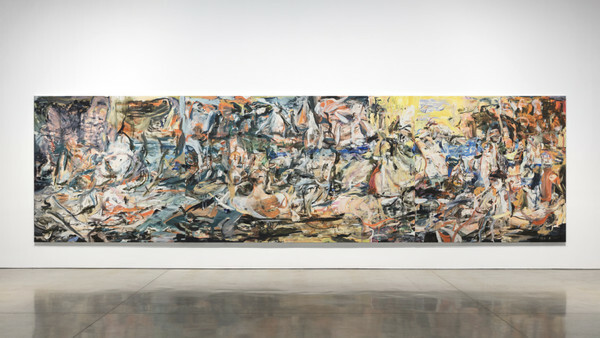 Well, it turns out that it is possible - if you’re name happens to be Cecily Brown. Cecily’s recent show at Paula’s, in which one enormous painting did indeed hold down the really long wall, was one of those shows, out of all the hundreds of shows that go up, and come down in the course of a season, that will be remembered and referred to for a very long time to come. Years ago, Cecily and I team taught a few times up at Yale. Needless to say, I was the good cop and she was the enforcer. Those kids really had to think twice about what they brought to a crit when Cecily was in town. There are still some standards by which authenticity is judged, mostly having to do with honesty and a lack of pretension. If you go to Cecily’s studio, you will see everything in the physical set-up geared to maximum concentration on and devotion to the art of painting. Custom made, long handled brushes hanging on custom made stands, mirrors on wheels to scrutinize a picture from the reverse angle, and canvases of all sizes in progress, all feeding off of and into one another. You come away with a clear impression of someone going for broke, someone for whom this act of painting is of very great, it’s not an exaggeration to say, life or death importance. And if you talk to Cecily, you will sense the qualities that one must have in order to hold that long wall at Paula’s – among them, in addition to the obvious ones like ambition and resolve, you will also hear self-criticality, the ability to entertain doubt, which is something I’ve always thought separated the good from the best: the ability to question even oneself. Not to strong-arm difficulty, but to work through and learn from it, and to come out stronger. It’s the women, of course for a long time now, who are really going all out, giving so much to their art, so that we all may share in their experience. It is with great joy that I give you one of tonight’s honorees, Cecily Brown.